We admittedly went silent with our Facebook research after 2011, keeping the best nuggets for clients regarding engagement and content strategy. 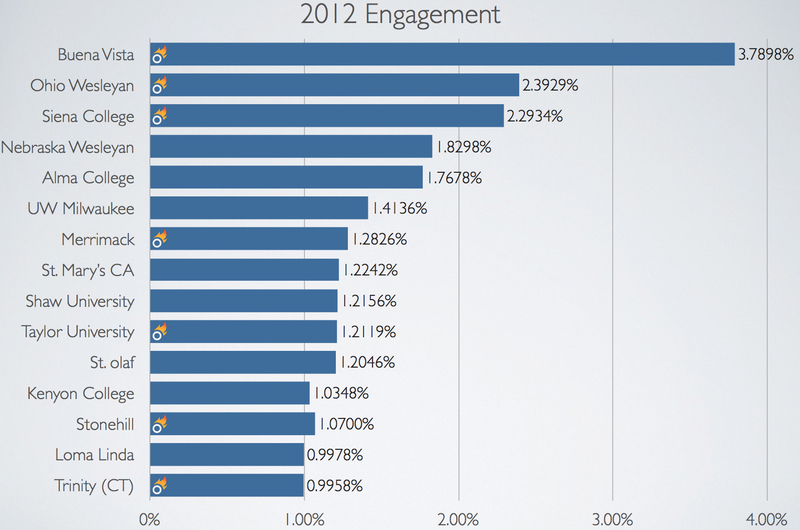 As a result, BlueFuego clients using our suggested tactics were #1, 2, 3, 7 and 10 in the nation for 2012 engagement (and 7 of the Top 15!). What was interesting to note that in 2011 the most engaging school in the nation (our client Merrimack College) had a .9708% engagement. In 2012, that same level of interaction wouldn’t have placed you in the Top 20. This means that Facebook engagement is going up for schools who don’t saturate and overwhelm their audience (more on that soon). With all the whining and complaining about decreased post reach starting in September 2012, you would have thought that it was the end of the world for Pages. But the opposite is happening. In 2013, we’re seeing 100-300% increases in engagement for clients when comparing to the same month last year. Simply put, Facebook knows their stuff. They are getting content in front of who it matters to, when it matters, and as a result the audience is responding more. It’s not about how much you’re spending on sponsored stories or promoted posts, it simply comes down to the same question we’ve been asking for 5 years now. Are you posting relevant, quality content? So as we wrapped up our 4th year of Facebook research and manually collecting data on over 1,500,000 posts from 1,400 universities and colleges, Joe got to wondering… would we see similar trends on Instagram? And with that, Joe dug in. He took the 1,000 largest Facebook Pages in higher ed on March 1st, and scoured Instagram for official, top level accounts. He came back with 429 of them. From there, he broke the groups down by account size; 200-499 followers, and 500+ followers. He also threw on a qualifier of 3 or more photos posted for the month. Engagement % is significantly higher than Facebook, but we are measuring interactions / # of fans so we expect this to decrease over time. Even still, Facebook data in 2009 never saw this level of activity. Even the 10 worst pages that we track have higher engagement than 99% of Facebook pages using our BlueFuego Formula. There is a correlation between the amount of content posted and the engagement. We feel like a broken record on this one, but we can’t stress it enough. Schools who listen to us (like, say, the 7 schools in the Top 15 of the Facebook data!) see success when they decrease the amount of content and focus the content towards what’s most likely to resonate or matter to the audience. Posting fewer than 10 photos in February yielded 12-18% engagement on average. Posting 30+ times yielded 2.5-3% engagement. It’s not rocket science! One benefit of Instagram is that it’s visual. Facebook’s downfall is that administrators use it as a dumping ground for everything that doesn’t matter to anyone… events, press releases, and more. That type of unappealing content doesn’t appear on Instagram. Seriously… just compare the last 2 slides and tell me that posting more than 15 times a month on Facebook and 10 times a month on Instagram. Work smarter, share better content, and win. Go get it. Take a look at the slides, and post your thoughts as a comment below.